Anton Gasnier has a thing about dust. His large desiccating machine is always warm, as ingredients like tomatoes, olives and raspberries sit in large trays slowly withering away until they are totally dry and can be ground to a fine and flavoursome powder. Do not, however, make the mistake of calling Chef Anton a gastromolecular chef. Although some of the techniques he employs in the kitchen of Soko – the 14 Riverside restaurant at which he is the head chef – are the same ones employed by famous gastromolecular chefs across Europe, he insists that, while these modern methods undoubtedly add an element of fun to his kitchen, his main passion is about making good simple food with fresh local ingredients. Fun is another element that apparently there is no lack of in Chef Anton’s cuisine. From fun techniques for cooking food, to fun ways of presenting food that add an extra level of surprise for the customer, in order to feel satisfied with his work, it would appear this French chef has to inject a certain amount of playfulness into his art. One such play thing is his smoking gun, which he proudly whips out to smoke a plate of cured tuna fish and iceberg salad. To do this, the ingredients are placed on a slate board and then covered with a glass dome. He proceeds to fill up the smoking gun with bourbon-soaked wood chips and then lights it, placing the mouth of the gun underneath the dome and pumping the enclosed air full of a thick aromatic smoke. 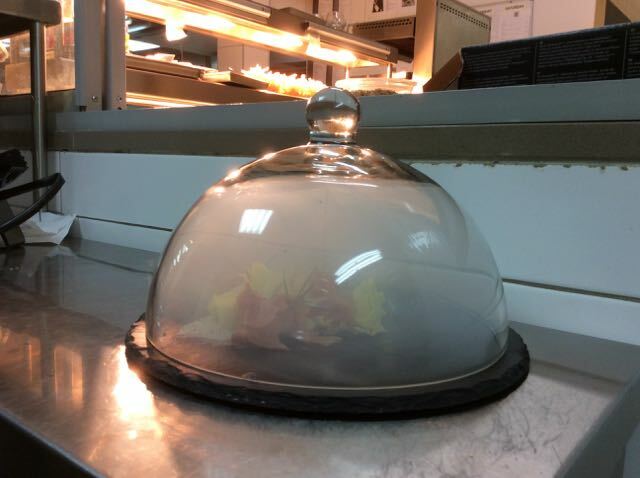 The plate is then delivered to the customer complete with the dome, so when they remove it, the bourbon-imbued smoke immediately hits their nostrils and changes the olfactory experience of the dish. Interestingly, the smoke manages to permeate not only the fish but also the salad, creating a smoky flavour quite unlike any other salad you have ever tasted before. It doesn’t end here. Although Soko, which is part of the dusitD2 Thai-owned hotel, endeavours to change their menu once every few months, one constant on the menu have been dishes crowned with a savoury foam. Chef Anton happily demystifies this technique that was made popular by the Spanish Chef Adria Ferria, at his famous restaurant El Bulli. There’s nothing more to making savoury foams than cooking a strong stock – in this case with thyme, garlic and parmesan crusts, adding a bit of lecithin as an emulsifier and frothing it up with what is best described as a maxi version of the cappuccino frothers that are commonly used in coffee lovers’ homes. The resulting white foam is so laden with flavour that it would be impossible to consume more than a couple tablespoons in one sitting. Yet the idea is so genius one can’t help but wonder why more chefs haven’t adopted this technique before. 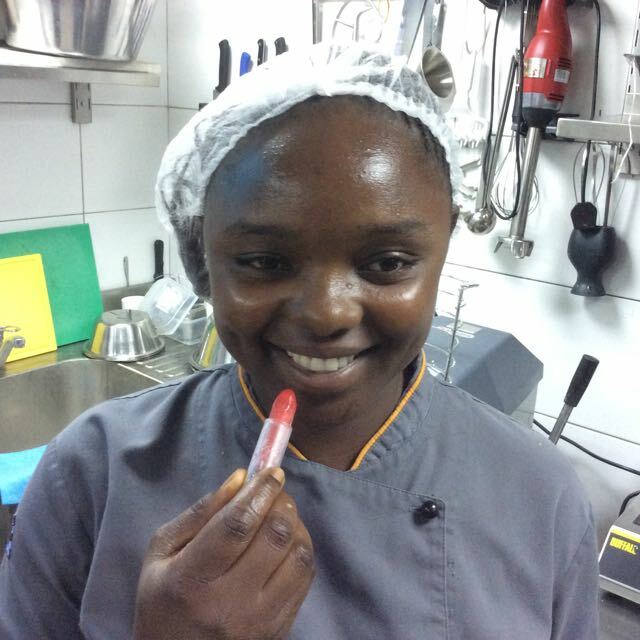 Never heard of edible lipstick? Well that’s not entirely surprising. However if you want to find out what this retractable stick is, Chef Anton is pioneering a raspberry sorbet one now; and it’s as delicious as it looks. Other techniques include cooking his meat in a sous-vide machine, a method that involves vacuum packing individual portions of marinated meat and then cooking them at around 60 degrees for anything up to 20 hours. The results are mind-bogglingly good. Sous-vide cooking allows all the flavours to slowly infuse, while making the meat so tender you’d be forgiven for thinking it was made of butter. Classically trained in France, Chef Anton spent over a decade working first at the Ritz Hotel in London and then at different Four Seasons restaurants across the world. Yet it’s difficult not to get the impression that he is relishing the freedom he has working at Soko. At the Ritz he was limited to making traditional “fancy” food and working in the Middle Eastern franchises of the Four Seasons, meant he could not experiment with alcohol and pork in his cooking. Whether he’s putting bamboo charcoal into breadsticks, making pistachio sponges or finding new ingredients to pulverise, one thing’s for sure – there’s never a boring day for Chef Anton in the kitchen at Soko.